Heather Leopard: What a Day for a Daydream! Are you are singing the little daydreamin' diddy now? I hope that wherever you are it's starting to look less like Winter and more like Spring. It's been quite warm here in Texas for some time now, warm enough to get in the pool this past weekend. 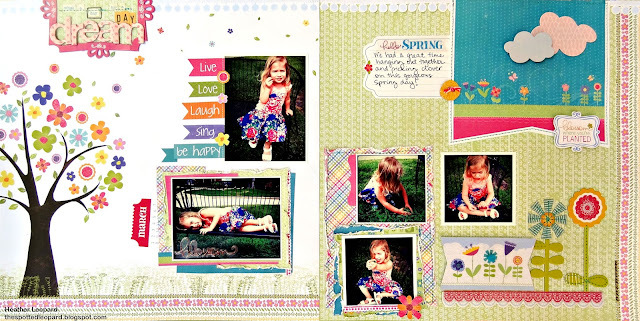 Today I'm sharing a layout I created with the new Little Yellow Bicycle Hello Spring collection. I absolutely LOVE the variety of embellishments that they offer with each collection. This layout is about a leisurely afternoon mommy/daughter moment outside. I'm on a 2-page kick lately, though I haven't posted them all here yet. I am especially enjoying mixing it up a bit with coordinating backgrounds. It might be a bit hard to see but I stitched on the tree to give it a more realistic look, including a heart shape in the center of the tree trunk. You may have to click to enlarge to see the details. I also cut one of the chipboard frames in half and used it to frame up my title by adding the background paper from the 2nd page behind it and topping it off with phrases and alphas. This layout has regular journaling on the upper right page but I also used the tear out tickets with the date to add a tad bit of hidden journaling. Make sure to head over to the Little Yellow Bicycle blog today to see Corrie and Liz's 2-page layouts and check in with us on National Scrapbooking Day for lots of fun and prizes! This is BEAUTIFUL!! I loveeeeeeeee the colors, the photos and loving the stitching on the tree! This turned put adorable! I LOVE the stitching on the tree! Love this LO!! Makes me wish I had girls to scrap about! Such fun papers! Great for your photos. very fun, I adore the stitching on the tree. You captured all the colors in her dress. Great job. 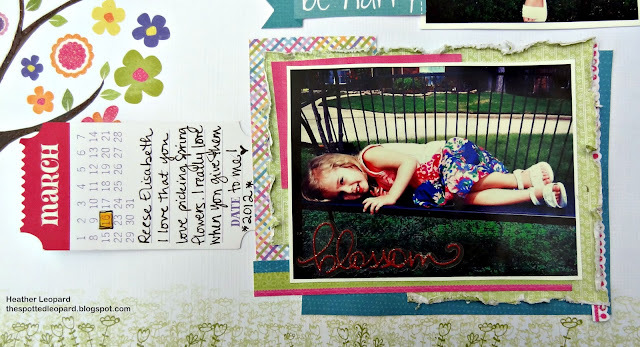 great embellishment details--LOVE how you rocked this page! gorgeous! i love all the details and the title work is so pretty! wow! love this double pager!! 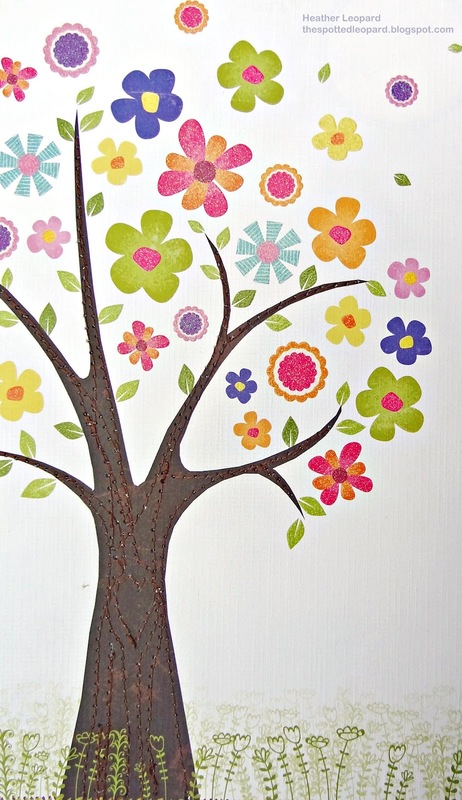 so colorful and love what you did with the tree! Super cute! I love the stitched tree. It is, finally, sunny and not raining here!